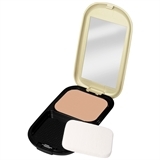 Crème Puff Powder Compact is a versatile, all-in-one compact powder for any occasion. Amazing light reflecting particles give a soft, subtle glow. Proven skin compatibility, so is good for all skin types. Use alone with moisturiser or on top of foundation.